The Colorado River wraps around Horseshoe Bend in the in Glen Canyon National Recreation Area in Page, Ariz. on Feb. 11. Knepper tells NPR's Lulu Garcia-Navarro about some of the idyllic locations that are seemingly being ruined because of exposure on Instagram. Horseshoe Bend is this beautiful spot 7 miles up the Colorado River from the Grand Canyon. It's in the Glen Canyon National Recreation Area, and the bend is very unique as far as waterway travels down there. It makes a complete 180-degree turn in a canyon 1,000 feet deep. I ran the numbers after doing a little bit of research, and the numbers do check out. On Instagram, Horseshoe Bend's popularity, in its hashtag or in its geotag, is normally 10 times as popular as anything else in that area. Well, popularity is very important. The outdoor world needs more visitors and more accessibility. The difficulty with managing that side of it is that construction effects can have averse conditions applied to the natural areas, if you start doing different buildings. It's not that all visitors are a problem, of course; it's just some places tend to have people who neglect responsibilities of their visitorship. In my article that I wrote for The Outline, I illustrate two other places that have also changed as a result of overwhelming popularity, specifically on Instagram. A smaller one, in Colorado, is Conundrum Hot Springs. After it became a spot to easily find on social media, the amount of visitorship went up really high. And the problem, since this is a very remote location where people hang around for a long time in the hot springs, is that they ran out of places to go to the bathroom. As a result, Conundrum Hot Springs had to be shut down for a little bit, while park rangers were up there with shovels to relieve that issue. Bathrooms were not built. They literally had to shovel up everyone's waste and pack it out for them. Vance Creek Bridge is probably the most famous spot within the Instagram niche. It is the second-tallest bridge in the U.S.; it's privately owned and is about a two-hour drive outside Seattle. Its location was revealed in 2012 on Instagram and since then, visitorship has just exploded. The railing company that owns the bridge has tried to slow down the amount of people visiting it by putting up a fence and then excavating the whole area around the bridge before it drops down over 300 feet towards the river. They haven't been successful with that, and as a result of vandalism, graffiti and a couple of unresolved campfires that caught the bridge on fire — they're just going to tear it down now. There's definitely a community aspect of it. There's nothing wrong with seeing a cool space on the Internet and deciding to go there. It's just, maybe, don't start fires there, and clean up your poop. NPR's Digital News intern Jose Olivares produced this story for digital. You scroll through your friend's Instagram feed and see the most beautiful spot and think, I want to go there. It's natural, right? And so you do. Turns out that you are part of the problem, according to Brent Knepper. In the online article "Instagram Is Loving Nature To Death," the travel photographer says that thanks to the photo sharing app, some of the best kept secrets of the natural world are drawing big crowds and literally altering the landscape. Brent Knepper joins me now from Chicago. Welcome to the program. BRENT KNEPPER: Thanks for having me. GARCIA-NAVARRO: Social media gets blamed for everything, I think (laughter). But in this case, it does seem to be true. Can you tell us a little bit about Horseshoe Bend in northern Arizona, which you use as an example. Describe that for us first, if you would. KNEPPER: So Horseshoe Bend is this beautiful spot 7 miles up the Colorado River from the Grand Canyon. And the bend is very unique as far as waterway travels down there, where it makes a complete 180 degree turn in a canyon a thousand feet deep. And it's a very lovely place as long as we're willing to share it with the crowd. GARCIA-NAVARRO: So tell me about that - share it with a crowd. Construction, apparently, has begun in a parking lot that will accommodate more cars at the spot. And there's also going to be a new viewing platform. But how is that related to Instagram? KNEPPER: So I ran the numbers, and the numbers do check out. 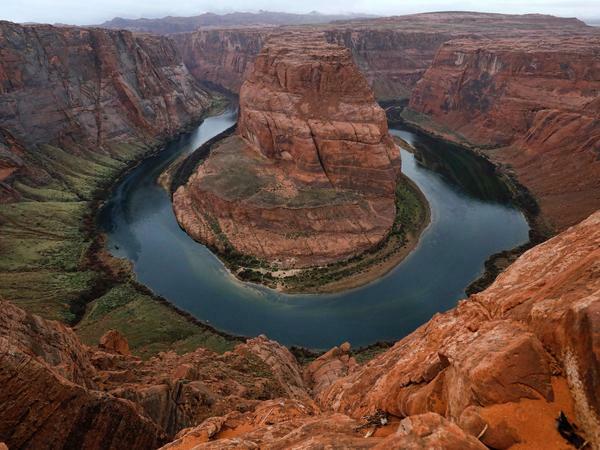 As far as on Instagram, Horseshoe Bend's popularity, be it in its hashtag or in its geotag, is normally 10 times as popular as anything else in that area. GARCIA-NAVARRO: But is that really a problem? Doesn't that popularity just mean that it might not be as unique, but it's still beautiful? It's still there. People can see it. KNEPPER: Well, popularity is very important. The outdoor world needs more visitors and better accessibility. The difficulty with managing that side of it is that construction can have adverse effects to the natural areas if you start doing different buildings and that sort of thing on top of it, but yes. GARCIA-NAVARRO: Is this an anomaly, though, when we're talking just about Horseshoe Bend or have you seen other spaces that have changed? KNEPPER: I have. A smaller one in Colorado is Conundrum Hot Springs. After it became a spot for people to easily find on social media, the amount of visitorship (ph) went up really high. And since this is a very remote location where people kind of hang around for a long time in the hot springs, they ran out of places to go to the bathroom. As a result, Conundrum Hot Springs had to be shut down for a little bit while park rangers were up there with shovels to relieve that issue. KNEPPER: Bathrooms were not built. They literally had to shovel up everyone's waste and pack it out for them. GARCIA-NAVARRO: Oh, that does not sound like a very fun experience. And what about Vance Creek Bridge? KNEPPER: Yeah. So Vance Creek Bridge is probably the most famous spot within the Instagram nature niche. It is the second tallest bridge in the U.S. It's privately owned. And it's about a two-hour drive outside of Seattle. Vance Creek Bridge - its location was revealed around 2012 on Instagram. And since then, visitorship has just exploded. And as a result of vandalism, graffiti and a couple of unresolved campfires that caught the bridge on fire, they're just going to tear it down now. GARCIA-NAVARRO: They're going to tear down the bridge? GARCIA-NAVARRO: What do you think is driving this for people? I mean, I might see a beautiful picture on Instagram and think, yeah, OK, I want to go to that place. But what is it that people get from going to a place that a lot of people have visited? KNEPPER: Well, there's definitely a community aspect to it. There's nothing wrong with seeing a cool space on the Internet and deciding to go there. It's just, you know, maybe don't start fires on it and clean up your poop. GARCIA-NAVARRO: Travel photographer Brent Knepper, thank you so much for joining us. (SOUNDBITE OF LYMBYC SYSTYM'S "PARABOLOID") Transcript provided by NPR, Copyright NPR.